For the Lithuanian masculine given name Algirdas, see Algirdas (name). "Alherd" redirects here. For places in Iran, see Alherd, Iran. Algirdas (Belarusian: Альгерд, Ukrainian: Ольгерд, Polish: Olgierd; c. 1296 – May 1377) was a ruler of medieval Lithuania. He ruled the Lithuanians and Ruthenians from 1345 to 1377. With the help of his brother Kęstutis (who defended the western border of the Duchy) he created an empire stretching from the present Baltic states to the Black Sea and to within fifty miles of Moscow. Algirdas was one of the seven sons of Grand Prince Gediminas. Before his death in 1341, Gediminas divided his domain, leaving his youngest son Jaunutis in possession of the capital, Vilnius. With the aid of his brother, Kęstutis, Algirdas drove out the incompetent Jaunutis and declared himself Grand Prince in 1345. He devoted the next thirty-two years to the development and expansion of the Grand Duchy of Lithuania. Two factors are thought to have contributed to this result: the political sagacity of Algirdas and the devotion of Kęstutis. The division of their dominions is illustrated by the fact that Algirdas appears almost exclusively in East Slavic sources, while Western chronicles primarily describe Kęstutis. Lithuania was surrounded by enemies. The Teutonic Order in the northwest and the Golden Horde in the southwest sought Lithuanian territory, while Poland to the west and Muscovy to the east were generally hostile competitors. Algirdas held his own, also acquiring influence and territory at the expense of Muscovy and the Golden Horde and extending the borders of the Grand Duchy of Lithuania to the Black Sea. His principal efforts were directed toward securing the Slavic lands which were part of the former Kievan Rus'. Although Algirdas engineered the election of his son Andrew as Prince of Pskov and a powerful minority of Novgorod Republic citizens supported him against Muscovy, his rule in both commercial centres was (at best) precarious. Algirdas occupied the important principalities of Smolensk and Bryansk in western Russia. Although his relationship with the grand dukes of Muscovy was generally friendly (demonstrated by his marriages to two Orthodox Russian princesses), he besieged Moscow in 1368 and 1370 during the Lithuanian–Muscovite War (1368–1372). An important feat by Algirdas was his victory over the Tatars in the Battle of Blue Waters at the Southern Bug in 1362, which resulted in the breakup of the Kipchaks and compelled the khan to establish his headquarters in the Crimea. According to modern historians, "For Gediminas and Algirdas, retention of paganism provided a useful diplomatic tool and weapon ... that allowed them to use promises of conversion as a means of preserving their power and independence". Hermann von Wartberge and Jan Długosz described Algirdas as a pagan until his death in 1377. Contemporary Byzantine accounts support the Western sources; Patriarch Neilos described Algirdas as "fire-worshipping prince" and another patriarch, Philotheos, excommunicated all Ruthenian noblemen who helped the "impious" Algirdas. His pagan beliefs were also mentioned in 14th-century Byzantine historian Nicephorus Gregoras' accounts. After his death, Algirdas was burned on a ceremonial pyre with 18 horses and many of his possessions in a forest near Maišiagala, probably in the Kukaveitis forest shrine located at 54°55′42″N 25°01′04″E﻿ / ﻿54.92833°N 25.01778°E﻿ / 54.92833; 25.01778. His alleged burial site has undergone archaeological research since 2009. Algirdas' descendants include the Trubetzkoy, Czartoryski and Sanguszko families. Although Algirdas was said to have ordered the death of Anthony, John, and Eustathius of Vilnius, who were later glorified as martyrs of the Russian Orthodox Church, the 16th-century Bychowiec Chronicle and 17th-century Hustynska Chronicle maintain that he converted to Orthodox Christianity some time before his marriage to Maria of Vitebsk in 1318. Several Orthodox churches were built in Vilnius during his reign, but later assertions about his baptism are uncorroborated by contemporary sources. Despite contemporary accounts and modern studies, however, some Russian historians (such as Batiushikov) claim that Algirdas was an Orthodox ruler. The Kiev Monastery of the Caves' commemorative book, underwritten by Algirdas' descendants, recorded his baptismal name as Demetrius during the 1460s. Following Wojciech Wijuk Kojałowicz and Macarius I, Volodymyr Antonovych writes that Algirdas took monastic vows several days before his death and was interred at the Cathedral of the Theotokos in Vilnius under the monastic name Alexius. Constantine (died before 30 October 1390), Prince of Czartorysk. According to J. Tęgowski, he may be son of Koriat. Vladimir Olgerdovich (died after October 1398), Prince of Kiev (1362–1394), Kopyl, Sluck. Ancestor of Olelkovich and Belsky families. Algirdas balanced himself between Muscovy and Poland, spoke Lithuanian and Ruthenian (among other languages) and followed the majority of his pagan and Orthodox subjects rather than to alienate them by promoting Roman Catholicism. His son Jogaila ascended the Polish throne, converted to Roman Catholicism and founded the dynasty which ruled Lithuania and Poland for nearly 200 years. Algirdas (Belarusian: Альгерд, Alhierd) is also widely honoured in Belarus as a unifier of all Belarusian lands within one state, a successful military commander and ruler of medieval Belarus. A monument to him has been erected in Vitsebsk in 2014, as part of the celebration of the city's 1040th anniversary. 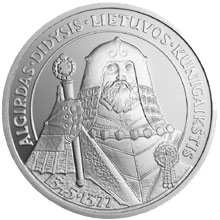 Algirdas was Duke of Vitebsk for over 20 years before becoming Grand Duke of Lithuania. Wikimedia Commons has media related to Algirdas. Bain, Robert Nisbet (1911). "Olgierd" . Encyclopædia Britannica. 20 (11th ed.). p. 80. ^ Muldoon, James. Varieties of Religious Conversion in the Middle Ages. University Press of Florida, 1997. Page 140. ^ "He was cremated with the best horses, clothes, resplendent in gold and girdled with a gilded silver belt and was covered with a gown woven of beads and gems", Marija Gimbutas has observed Archived 9 June 2007 at the Wayback Machine. ^ Contributed by Antoni Prochaska, Jan Ochmanski, Gotthold Rhode, Marija Gimbutas, Edvardas Gudavičius etc. ^ Mažeika, Rasa (1987). "Was Grand Prince Algirdas a Greek Orthodox Christian?". Lituanus. 33 (4). Retrieved 6 September 2007. ^ Tęgowski J. Który Konstanty — Olgierdowic czy Koriatowic — był przodkiem kniaziów Czartoryskich? // Europa Orientalis. — Toruń, 1996. — S. 53-59.